As with any election, international (and certainly British) bookies will let you bet on it. And in case of the Brazilian presidential election next month, the betting houses agree with European and US investors who conclude the same over the weekend: Mr Jair Bolsonaro’s chances of winning the presidency of Brazil have greatly improved after the attack. Brazilian equities, the ‘Real’ currency and its sovereign bonds have all done very well ever since the right-wing conservative front-runner Mr Jair Bolsonaro suffered a near-fatal stabbing at a campaign rally Thursday in Minas Gerais. RBC Capital Markets to Aberdeen Asset Management even made favourable comments about Brazilian assets in the aftermath to its clients. Given that the market expects Mr Bolsonaro to make a full recovery, it is clear that they thoroughly prefer him over a return of the left-wing Workers Party or a victory for the Green Party of Ms Marina Silva. Related coverage: <a href="http://thegoldwater.com/news/36435-Brazil-Election-Bolsonaro-Lost-40-Blood-After-Socialist-Stabbing">Brazil Election – Bolsonaro “Lost 40% Blood” After ‘Socialist’ Stabbing</a>. International investors furthermore agreed that the history of the attacker as being a left-winger who was a member of a party affiliated to the Workers Party will set off many people from voting for them. Whereas before the attack some 60% of Brazilians claimed that they would never vote for Bolsonaro, this percentage has now dropped to 44%, meaning that he has clearly gained sympathy from that passionate population. International betting houses agreed. 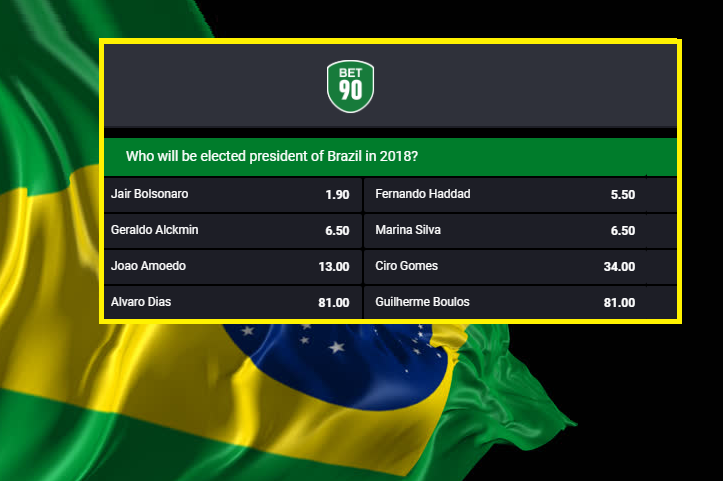 Bet90 lets you place money directly on who will win over the two rounds, and Mr Bolsonaro’s chances are now slightly better than two-to-one. His competitors Mr Haddad, Mr Alckmin and Ms Silva have seen their chances of clinging the presidency worsen.